Well, it seems we are all still frantically reading the authors that will be attending the Tucson Festival of Books. I recommend checking out Charles De Lint for any fantasy fans. My personal favorite is Dreams Underfoot. It is a compilation of short stories that all take place in the magical town of Newford. The best part of this book is that several of the stories have characters that weave together, giving you a new perspective on what at first appears to be a minor character. I am also reading The River King by Alice Hoffman. I am really enjoying how Hoffman’s small town seems to have a personality all of its own, making the story not just about the characters, but about the town itself. Hoffman has a unique way of narrating her story. It is more like you are being told the story by a storyteller than reading a book. Her narration styles gives the entire book a magical feel. One of my co-workers is reading Louise Ure and loving the mysteries. In fact, she didn’t read just one of her books this week, but at least two. 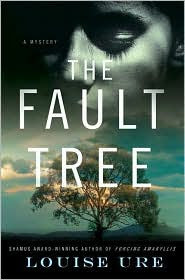 Ure’s newest book is called The Fault Tree and is up for several awards. It is a mystery about a blind auto mechanic who overhears a murder, and consequently pursued by the killer. This is yet another story that takes place in our lovely Southwest. So, what is everyone reading for this month’s, or next month’s, book club? I know many groups are reading Olive Kitteridge by Elizabeth Stout, The Art Of Racing In The Rain by Garth Stein, Interred With Their Bones by Jennifer Lee Carrell, Wolf Hall: A Novel by Hilary Maniel, but what else? Bobbe’s book club just finished having everyone read a biography of their choice. I thought it was a fun idea having everyone read something different, and then share; very similar to the style that the characters of The Guernsey Literary Potato Peel Pie Society had for their book club. The store’s book club will be reading No Angel by Jay Dobyns (who will be attending the Festival of Books) as one of our March books. But mostly, I am just curious as to what everyone else is reading. Does anyone have a good suggestion for a book club book? Let me know. It’s time to start preparing for the Tucson Festival of Books that is coming up on March 13th and 14th. This is an event to mark on your calendar. There will be over 400 authors appearing at the festival, such as J.A. Jance, C.J. Box, Susan Cummins Miller, Terry Brooks, Vicki Lewis Thompson, and many more. It takes place at the University of Arizona Campus Mall. So, stop over and see your favorite author, or find a new author to start reading. And don’t forget to stop at the Mostly Books booth while you are there. Here is the link for more information on the festival. To get us in the proper Festival of Books mind frame, we have all started to read authors that will be attending the festival. I am reading J.A. Jance, Alice Hoffman, and Julia Quinn (or at least I am starting with these three). Others have started reading Rachel Gibson and Elmore Leonard. Polly said that she has been enjoying Leonard’s western series, perhaps even more than his mysteries. The stories all take place here in the Southwest, and are very descriptive in regards to the desert scenery. The stories are short, making them ideal for someone who only has a few minutes a day to read. Overall, they are just a fun read with very believable characters. Let us know who you are excited to see at the festival, or recommend a book that we should read before the festival. One of the ladies here at the bookstore is reading the novel No Time For Goodbye by Linwood Barclay. She said that she is really enjoying the book, but the time-line is a bit unconventional. The story is about a fourteen year old girl who wakes up one day to find her entire family has vanished. The story then skips twenty five years into the future with the main character still unaware as to what happened to her family. The rest of the novel pieces the mystery together with flashbacks to the past, giving it a bit of a detective feel. So, here is my question to you readers: What do you think of movies based on books? Personally, I have rarely found a movie that even remotely compares to the book. I did think that the movie A Time To Kill by John Grisham was just as good as the book, but aside from that I am unable to think of one. I have been told that The Firm by John Grisham was just as good as the book, however I disagree since they made so many changes to the plot. I was very unhappy with the movie version of The Other Boleyn Girl by Philippa Gregory, it felt like a completely different story. The most current books made into movies out are, The Lovely Bones and The Lightning Thief? So, after you read the book and watch the movie, let us know what you think. So, what does everyone think? Please post a comment on your thoughts about books made into movies. And don’t forget, “Never judge a book by its movie”. I decided to post the top 10 bestselling books from the end of January (according to USA Today). The list gives the top 150 bestsellers, but that was just a few too many for me to mention. If you are interest in reviewing the list here is the link. I found the list to be about what I expected, but there were a few surprises. At first I was shocked that Eclipse was ahead of Breaking Dawn. However, Breaking Dawn is still only in hardback, which of course is more expensive. I was happy to see The Lovely Bones as number 3. It is such a well written novel. The story is emotional, but well worth the read. The Girl With the Dragon Tattoo is number 17th, hurray. If you haven’t read that one yet and are looking for a good mystery, I highly recommend it. In fact, we all enjoyed this book here at the bookstore. It is written by Steig Larson and is the first of the trilogy. The story takes place in Switzerland and is about a journalist investigating a missing person and the wealthy family involved. Be prepared to want to start the second book immediately after finishing the first. Have fun looking over the list, and hopefully you will find another book to read. Heat Wave ended up being a fun read. The last half of the book had several twists and turns, keeping me turning the pages. Heat and Rook continued their playful and flirty relationship, making the two very entertaining. The authors clearly enjoyed writing the book, and had fun with the characters. I recommend this to anyone looking for a fast read, and who enjoys a good murder mystery. One of the bookstore employees just finished reading Game Change by John Heilemann and Mark Halperin. She said it was a fascinating read. The non-fiction book recounts the behind the scenes of the 2008 Presidential election. The book is based on interviews of the people involved in the campaign. The book reads more like a novel than non-fiction. Now, the author did use some unusual words, but don’t let that intimated you. If you are at all interested in politics this would be an excellent read. I am currently reading Heat Wave by Richard Castle (a.k.a. The writers from the ABC show Castle). So far, I am really enjoying the book. The story reads like an episode of the TV show Castle, which is exactly what a fan of the show is looking for. The story moves along at rapid pace, all the while keeping me very entertained; in fact I have a hard time putting the book down. Heat Wave is a murder mystery story that takes place in New York City, NY. The head detective, Nikki Heat, is being shadowed by a journalist, Jameson Rook. The two characters are playful and witty, creating a great dynamic between the two. Heat seems to have some personal experience with murder crimes, making her a more sympathetic detective. Rook seems to be a bit full of himself, but still charming. I am only half way through, but I am sure to finish the book in the next couple of days, and I will give my final opinion of the book then.